Why would I pick this game? It has the big muscled space marine people, the gruff voice acting, and the excessive gore. Well…I’ve never been a gamer that cares that much for aesthetics, at least in the sense that it ultimately dictates if I buy/don’t buy something. If I did follow my lust for art direction…I never would’ve given Bayonetta, The Walking Dead, Amnesia: The Dark Descent, Dragon’s Dogma, Infamous 1-2, Dragon Age: Origins, etc. the time of day…and I liked all those experiences. It really comes down to the game design for me, where it’s either innovation that provides a new experience, or extensive iteration that renews a strong familiar one. Gears of War 3, being the 3rd title in the franchise, mostly fits the iterative criteria, since it heavily refines the basic formula established by the 1st game in the series…and is oh so strong for doing so. The core foundation of the games has always been based around cover. While multiple stealth games before implemented cover solutions, they were fairly rigid, and based around avoiding detection or peaking around than engaging in combat. Kill Switch was also a clear influence in how its levels and combat were designed around cover, while adding blind fire to the mix. 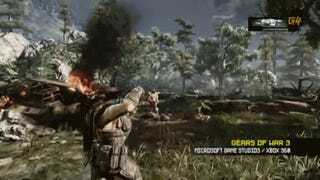 However, there is a reason Gears of War popularized it, and that’s due to how it implemented controls. Many games that get credited with invention of a specific mechanic, aren’t often the originator of it. Resident Evil 4 is seen as the first game with over the shoulder third-person aiming, when the original Splinter Cell did the same thing 3 years previous…but the aiming controls were weaker, along with the overall product selling less to be noticed. Solid execution at the end of the day counts for a lot, and numerous game designers have said this ad nauseam…even if they didn’t achieve it with their own games. Barely anyone remembers Killswitch, because the cover system was finicky, the weapons rote with little sense of impact, the level design fairly gimmicky and boring, and no real style or personality to speak of. 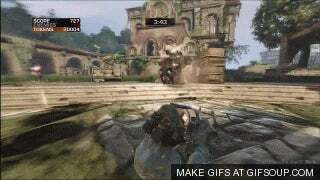 Gears of War on the other hand released not long after the 360 launched, was a huge step up in terms of graphical fidelity (largely through modularity), featured super responsive controls that pioneered methods of animation blending, a strong suite of weapons with different uses, enemies that matched those weapon types ala Halo, and level design that was varied in how it tackled cover. Gears of War 1 was a game that made you feel heavy like a tank, yet nimble to avoid the description of “tank controls” like Resident Evil. Now suddenly a grenade was given close-range functionality to disable an attacking enemy, and fling him back towards others. These are just a few highlight features that represent the changing dynamic Epic wanted to go with the 3rd game, where they wanted players to be able to adjust their tactics more on the fly. Instead of having cover as a comfort, you suddenly had enemies like the Armored Kantus that could roll around the field like an armadillo, Boomers with Digger Launchers that would fire under cover to explode on you, and the elusive Serapede worms that slink low on the ground, who can only be killed by blowing up their body from tail to mouth. This altered dynamic even gave new breath to established mechanics, like the Boomer shields cover-on- the-go. While none of these changes fundamentally alter the core mechanics, the actual experience is very much different. Suddenly in co-op during the main campaign, I’m darting around levels, which have increased in sized with multiple routes around to deal with various threats. It just became a far more dynamic and enjoyable experience. Heck, the game even made some additions it should’ve had in the first place, like being able to play as a woman. Since I mentioned co-op, I might as well jump to that. Co-op has always been a huge part of the series, right from the get go playing with my roommate through the first game’s campaign. Co-op shooter campaigns have never been a common thing, and at the time never handled with the care Gears 1 provided. You had full on revival mechanics to assist your friends, and multiple deviating routes that would put you in different tactical positions. As the series evolved, Epic took advantage of the co-op appeal, augmenting their Unreal Tournament Assault Mode in to Horde Mode. I can’t really think of a specific multiplayer mode this gen that had the impact of Horde in Gears 2. It became popular enough that it almost eclipsed the main campaigns, and enough that Gears 3 expanded it further through tower defense inspiration. What this added was a sense of progression through the oncoming waves, more tools for your teammates to assist each other, new variations on level design…and just something to do between the waves themselves. 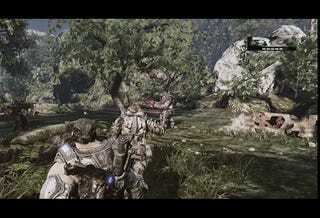 Not content to sit on that, Gears 3 again altered the play dynamic through the multiplayer mode: Beast Mode. Like all enemies in this game, the ticker isn’t just identifiable by look, but by its distinguishing sound. Sound design is always the underrated aspect to games that under the hood is what makes the engine purr. The better action games sell that sense of impact not just with animation, but sound timed with it. Without our sense of touch in a game world, I argue sound is important to make up for the handicap. Gears of War 3, for all its machismo and angst, is actually an incredible smart and well-designed game. It builds on a strong core foundation, and focuses on making changes that alter the dynamic of play, and in a way that is better than the previous entries. It is a hero of this fading gen, and a reminder iteration can mean improvement.